When the Xero Practice Manager is set up to integrate with SuiteFiles you can access all of your client files that are stored in SuiteFiles from the Xero Practice Manager's client document tab. 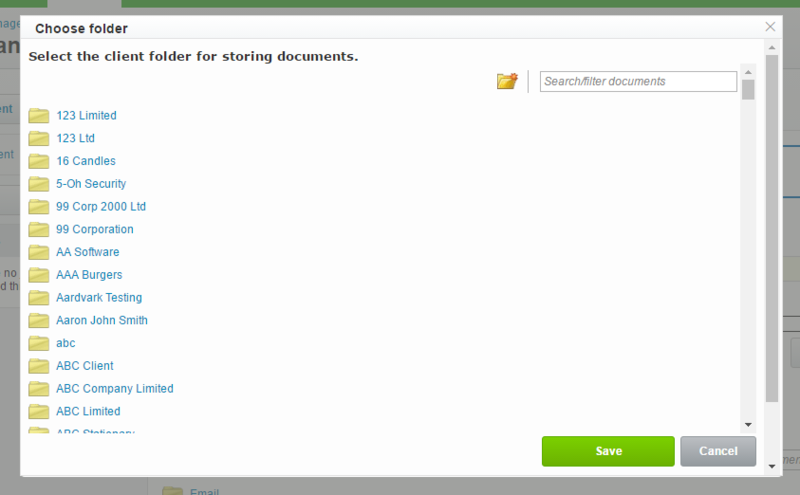 The Xero Practice Manager can only access files within the Clients folder of SuiteFiles. Our recommendation is that in SuiteFiles you have a subfolder for each client entity in XPM directly under the Clients folder in SuiteFiles as per the screen shot. Within the client folder you can have any sub folder structure that makes sense for your business. And the sub-folders can have further sub-folders of their own. When you open the Documents tab in XPM it looks into SuiteFiles for a client folder with exactly the same name as the client in XPM. The Documents tab for the client in XPM shows exactly the same folders and files that are in SuiteFiles. XPM displays the folder name that it's looking for within SuiteFiles to display. 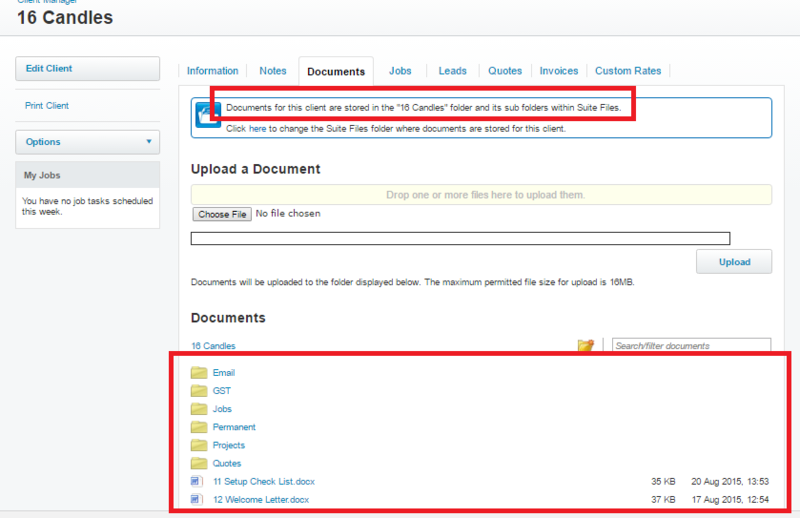 You can navigate through the folders via the XPM interface.If the client folder is empty or does not yet exist in SuiteFiles then XPM will say The folder is empty. If the folder that XPM is looking for doesn't exist or you wish to have XPM look in a completely different client folder in SuiteFiles there's a manual over ride option. Click on the here link. This displays a list of all the available client folders. Select the one you need and save. XPM allows you to save documents against a client's job. This uses a specific folder structure Clients > Client Name > Jobs > Job Name. 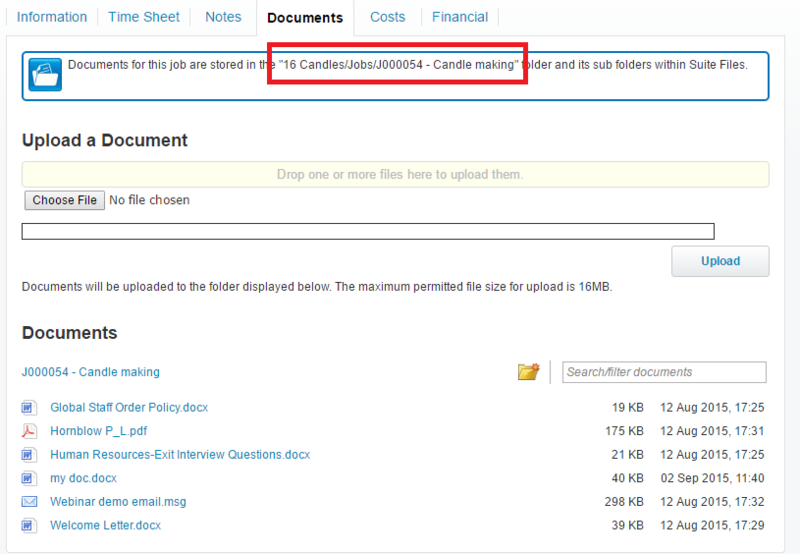 For example, this job folder in SuiteFiles has documents for job "J000054 - Candle making". XPM allows you to save documents against a client's quote. This uses a specific folder structure Clients > Client Name > Quotes > Quote Name. 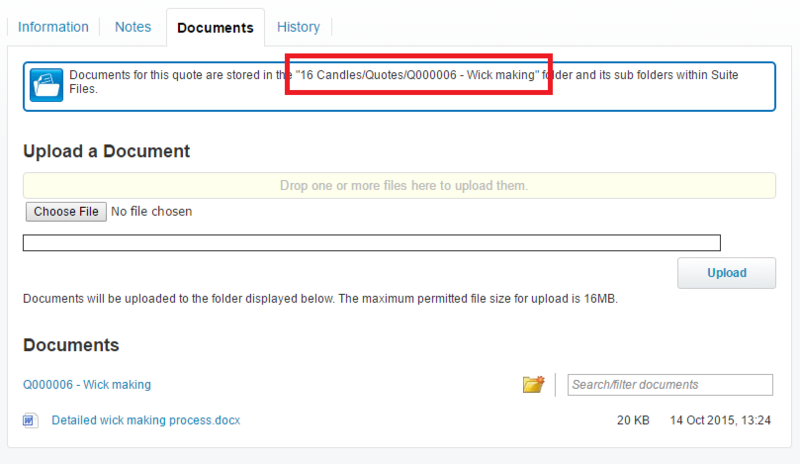 For example, this job folder in SuiteFiles has documents for job "Q000006 - Wick making".